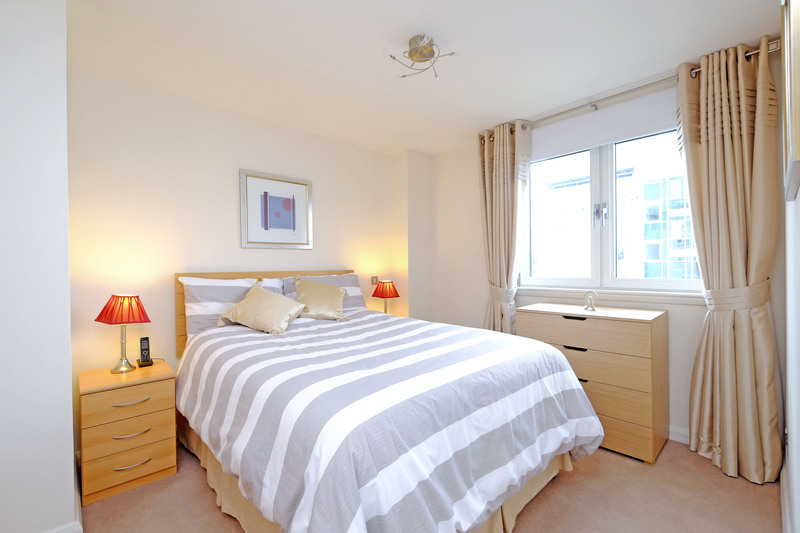 2 Bdrm 5th flr Executive flat. Hall. Lounge/Dining kitch on open plan. 2 Bdrms. 1 with ensuite. Shower rm (CT band - E). Parking. Price over £290,000 Entry by arr. Viewing 07905 231957. (EPC band - C). 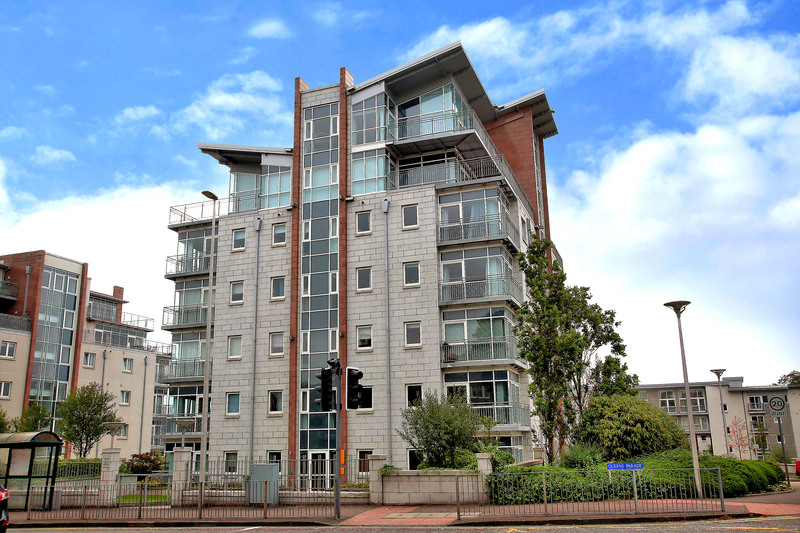 The Law Practice is delighted to offer for sale this immaculate, most attractively presented and ready-to-move-into two bedroom executive apartment, complete with secure underground parking. 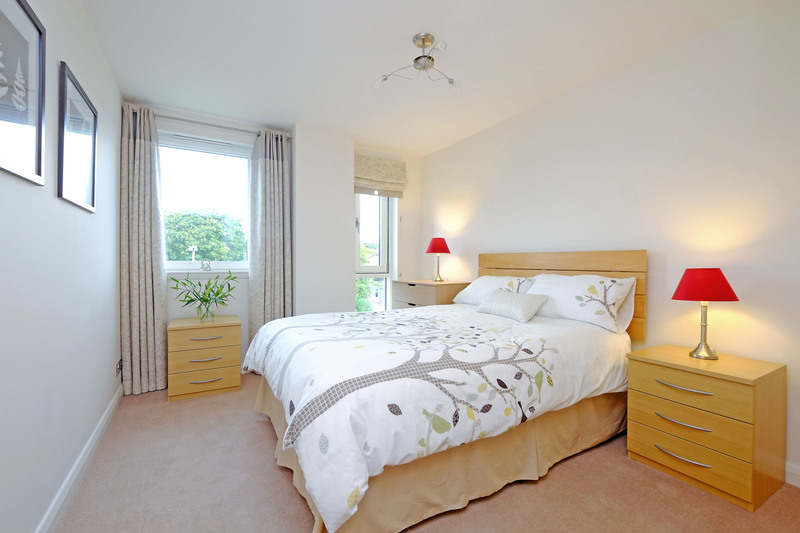 The property, which is presented in neutral tones throughout is located on the fifth floor of the prestigious Stewart Milne development at Kepplestone, enjoys abundant light and west facing views. 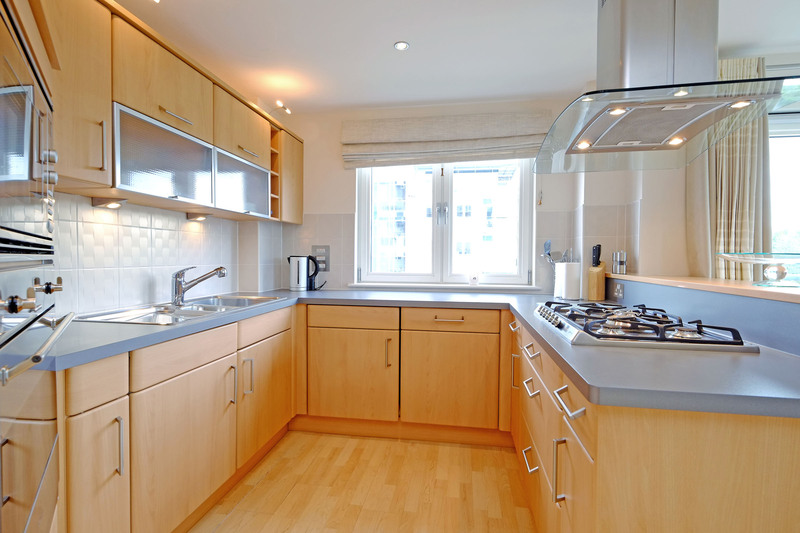 Excellent facilities include video entry system, lift access, concealed wiring in the kitchen and under floor heating, as well as full double glazing. The development is maintained under a factoring arrangement and the communal areas are extremely clean, fresh and attractive. The property would be ideal as a first time buy or as a rental investment. 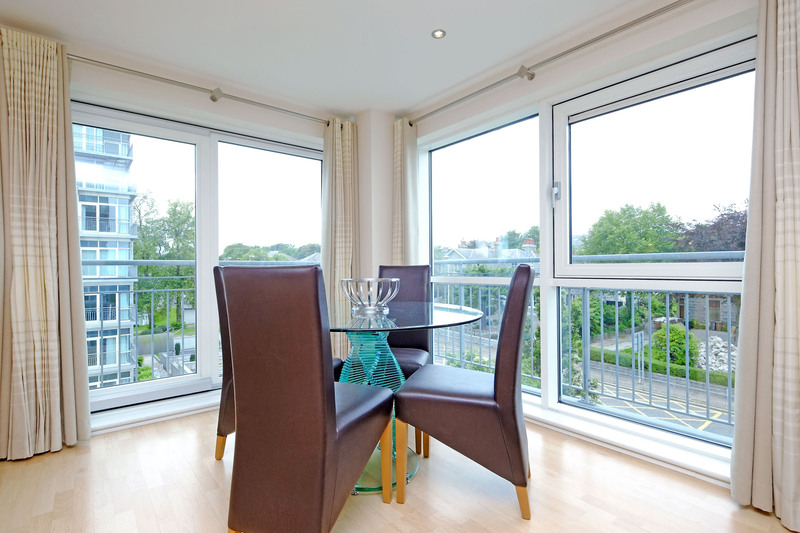 Kepplestone is located on Queens Road, a delightful wide tree lined street situated in the heart of the city’s fashionable west end. 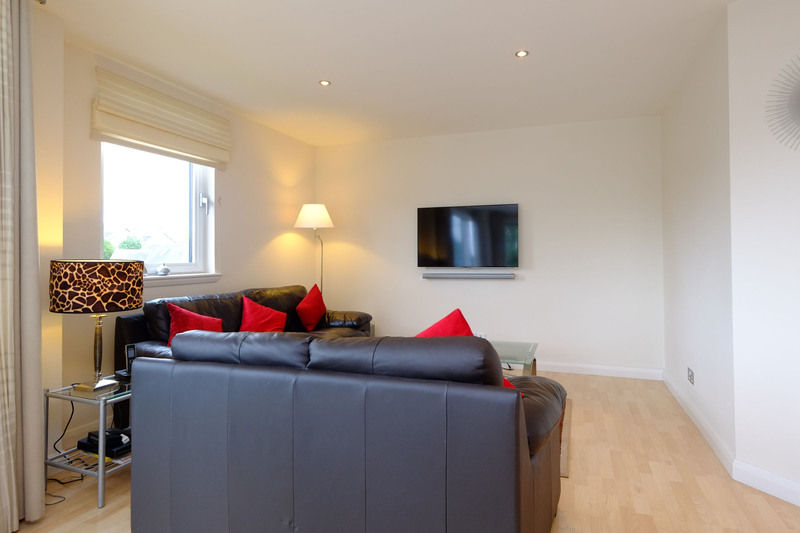 The location is ideally located for a range of amenities and within easy driving distance of the main Aberdeen ring road, which provides commuting to both north and south of the city. 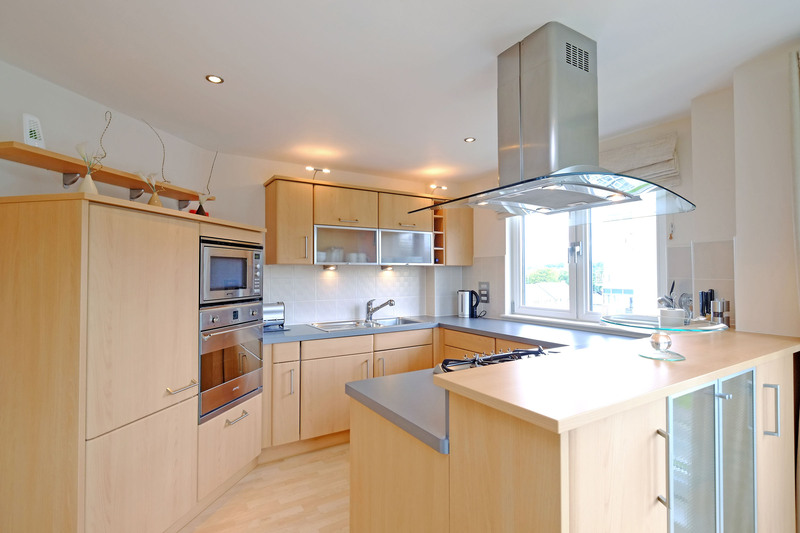 The area is served by an excellent range of schools and is within easy access of the business centres in the West End and at Hill of Rubislaw. Entrance hallway: A very welcoming, spacious entrance to the property, accessed via a wooden door with spyhole. 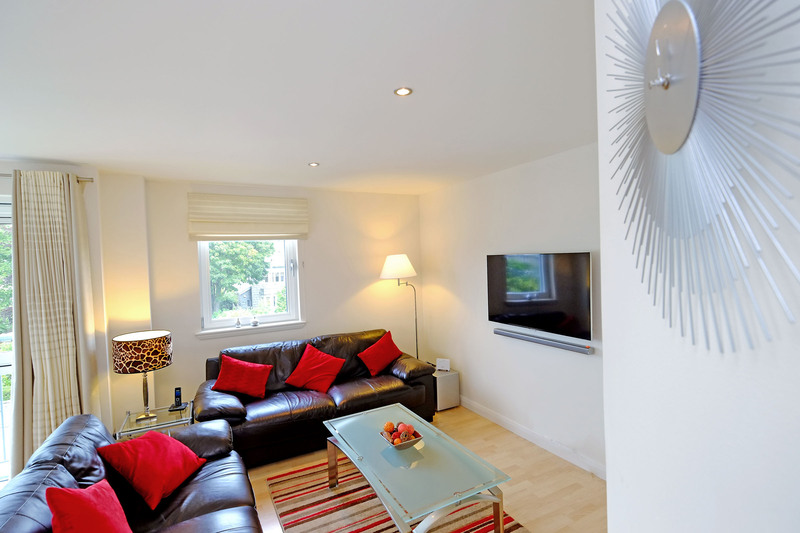 Decorated in light, neutral tones with laminate flooring, the décor sets the tone for the rest of the property. A brilliant addition to any home, the hall boasts great storage options in four full-height cupboards housing boiler and utility meters. Halogen ceiling downlighters and video entry control panel. Lounge/dining kitchen on open plan: (20’9” x 18’6”): Fantastic space with striking floor to ceiling dual aspect corner windows dressed with floor length neutral curtains and allowing abundant natural light as well as access to the Juliette balcony and open, interesting city views. Additional windows in the lounge, to the front of the property, and in the kitchen, to the side are dressed with complementary blinds. The comfortable lounge area is well proportioned and flows into the generous dining area. 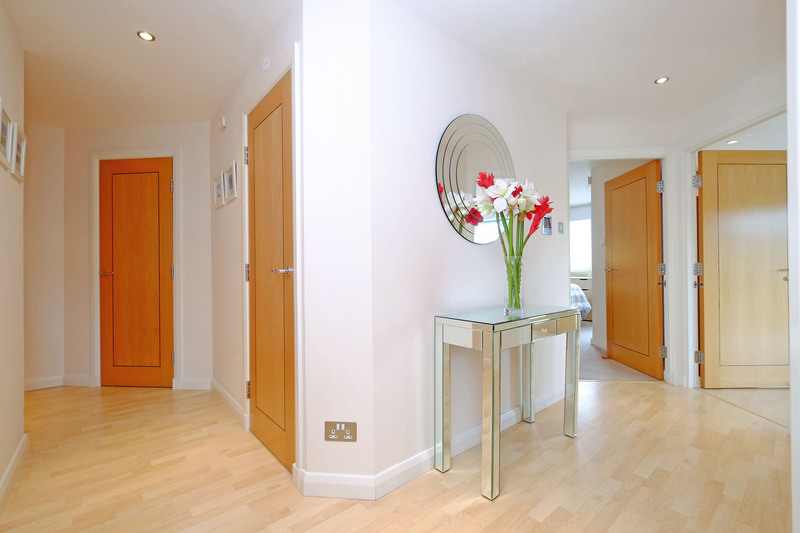 The attractive décor mirrors the laminate flooring and wall colours as elsewhere in the property. Television and telephone points. Halogen ceiling downlighters. Note: wall-mounted TV not included. The fitted kitchen boasts a mix of quality floor and eye-level units in addition to front-facing cupboards in a breakfast bar-style unit. Pale woodwork, grey worktops and complementary splashback. The white goods are integrated and include a large fridge, larder freezer, microwave, washer/dryer and dishwasher and oven. Smeg five-ring hob and chimney extractor hood, Stainless steel sink and drainer. Halogen ceiling downlighters. Master suite: Master bedroom (13’6” x 9’1”): This suite has an air of elegance about it, being extremely spacious and beautifully decorated in llight, neutral tones with complementarycarpeting. 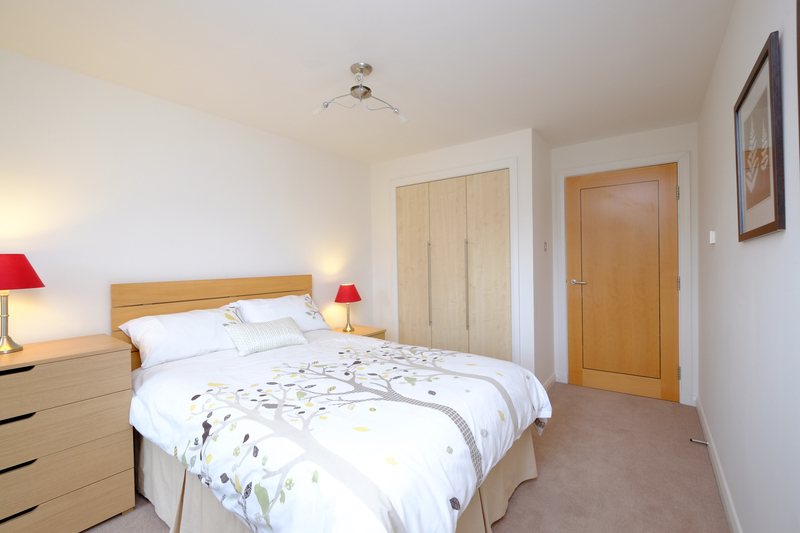 Two fitted wardrobes, both with hanging and shelving space, as well as space for freestanding furniture. Window to the side of the property, dressed with plush full-length metallic curtains. Modern light fitting. Door to en-suite bathroom. En-suite (8’1” x 7’7”): A luxurious, immaculately presented bathroom that includes a four-piece suite in white, comprising a generous bath, shower with rainforest and handheld showerheads, basin and toilet with concealed cistern, set in a vanity unit. Two tall mirrored cupboards with shelves, shaver socket. Chrome ladder radiator and further towel hook. 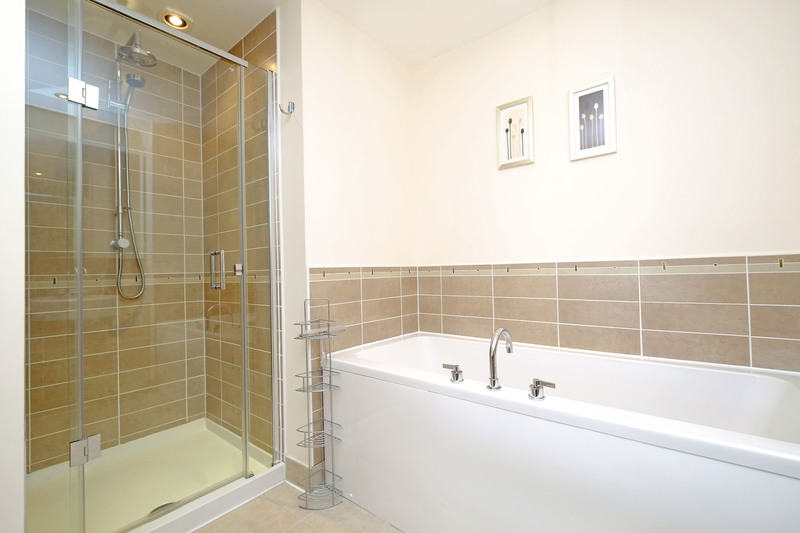 Tiled flooring, as well as tiling in the shower and around the vanity unit. Inset halogen downlighters. Bedroom 2 (12’6” x 9’4”): Another very attractive and welcoming double bedroom, this time with double aspect front facing windows, one dressed with a blind and the other with full-length curtains. 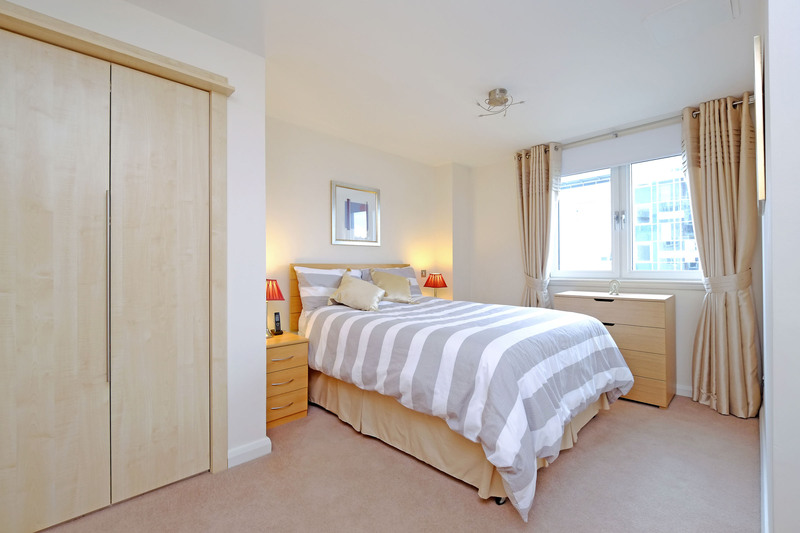 Triple fitted wardrobes with hanging and shelving space. Light walls and carpeting with a three point modern ceilinglight fitting. 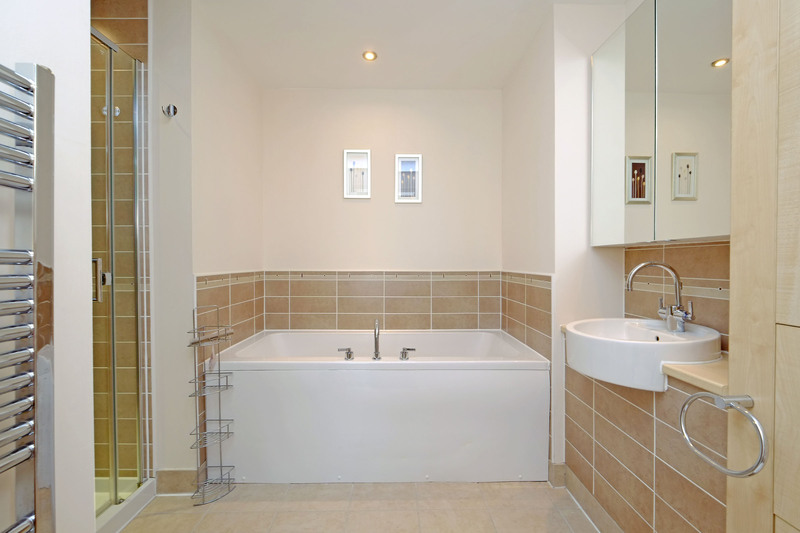 Shower room (6’4” x 4’7”): Fitted with a contemporary three-piece suite. Generous shower cubicle with rainforest shower head, hand held shower head and glass door with handle. The basin and toilet with concealed cistern are set in a light wood vanity units. Excellent storage in two tall mirrored cupboards with shelves, shaver socket. 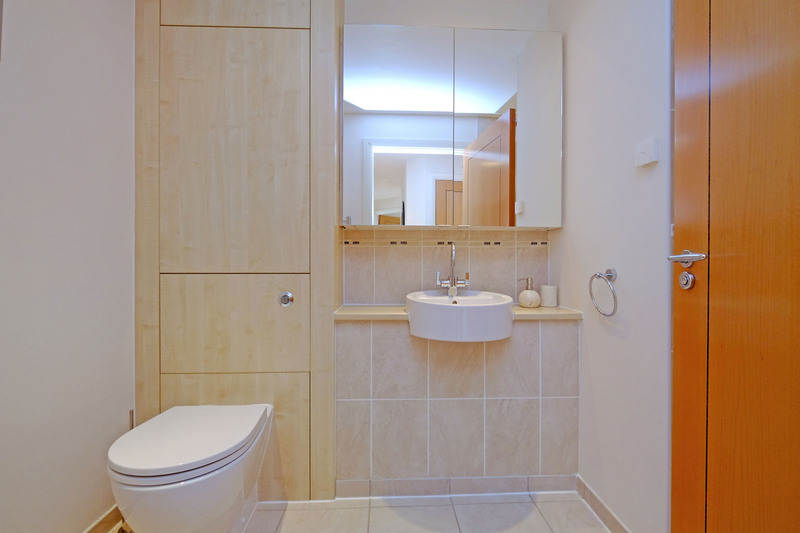 Light tiled flooring, neutral walls and taupe-coloured tiles in the shower and around the vanity unit. Spotlight lighting across the ceiling. Chrome ladder radiator and further towel hook. 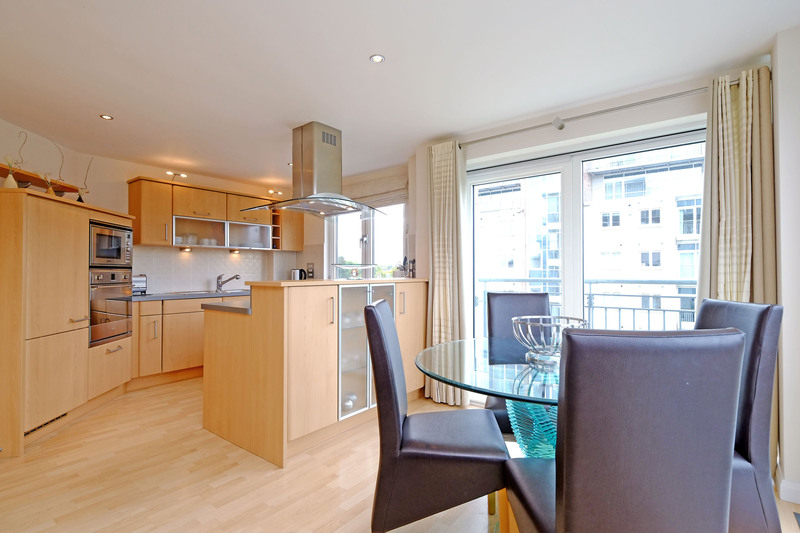 Outside: The property is set within landscaped grounds and benefits from well-lit, secure allocated underground parking. There is additional visitor and cycle parking and an on site recycling facility. The development is well-maintained under a factoring agreement. Directions: Travelling from the west end of Union Street proceed onto Alford Place, Albyn Place and at the Queens Cross roundabout continue straight over onto Queens Road. Proceed to the Anderson Drive roundabout and the Kepplestone development is situated on the left hand side. To enter the development take a left at the lights and at the small roundabout turn left. Number 70 Queens Highlands is located in the first block on the left. For access to the block, use the security entry system on front of the car park to call number 70. On entering the car park, take a left and you will see two doors and a further security entry system. Again, call flat 70 and enter the door on the left hand side. The property is located on the fifth floor.